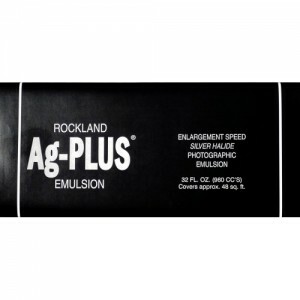 Ag-Plus© is a black & white photographic emulsion that has extra silver-halide content for higher speed and contrast making it especially fit for use in-camera, as for tintypes or ambrotypes, or for making oversize prints at a considerable distance from the enlarger. It works on anything but is optimized for non-porous surfaces like metal, glass and ceramic. Processing and final appearance of prints made with Ag-Plus are the same as Liquid Light. The economical quart size ships as four half-pints.